A collection of twelve lively stories with regular, repeated word sounds that are hugely appealing to children learning their first words. Very simple text encourages reading, helping children to sound out individual letters, then blend them together to make whole words. 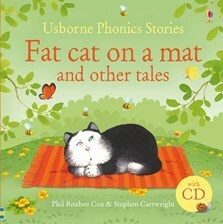 Contains a listen-along CD that brings the stories to life with charming readings. My 20 month old loves this book so much that I have now hidden it from her : ) Charming as it is, 20 times/day for the past 2 weeks is making Mommy crazy! She talks about the "egg fall on fox head, oh no" in her sleep even. Excellent book.